If you are planning to go out and watch the second installment of Pacific Rim movie, then we suggest a date night instead. Except for the routine VFX and graphics, the movie has failed to carry the legacy of the Pacific Rim franchise. Yeah, the storyline of the movie does has an interesting connect which we are not going to share here because of SPOILER ALERT and we hate doing such things no matter how the movie is. Overall the movie has connected well with its predecessor but there are few things which aren’t convincing at all. Starting from John Boyega, the lead who had a big fallout of emotions and expressions along with bad voice modulation to housing too many young characters. 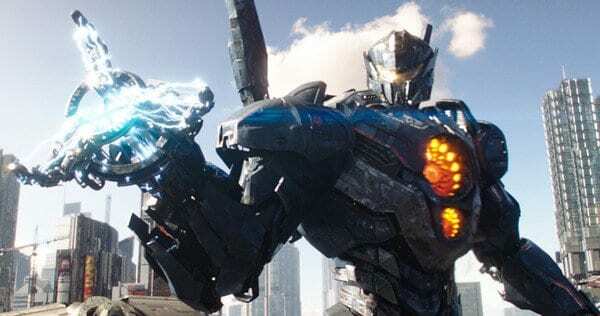 Further, the aura of franchise, which was built upon on the heavy duty acting skills of Idris Elba, wasn’t carried forward in Pacific Rim: Uprising. The movie did have some awe moments but comparatively to what was expected from the movie failed completely at the time of delivery. Since the first movie had a very strong execution of acts and came filled with some of the great acting skills, the same looked amateur in the second one. Although the few characters taken from Pacific Rim tried there level best, to which they did pretty well but the expectations were a bit higher as the concept of the movie was new the audience in the first case. What audience had to say? One of the close friends of Filmee Keeda, Mr. Somya Pratap who rated the movie as 2 stars out of 5 found the movie falling apart after the half-time. Though according to him, he was pretty much amazed by the character of the rogue scientist in the movie, he still quoted the same, “The first one was way better”. Another person who came with Filmee Keeda to watch the movie, Onish claimed that the concept and the story were good but the movie entirely failed to grab the audience. He rated the movie as 2.5 out of 5 stars. On its first day, Pacific Rim 2 failed to capture even 20% theater seats. While we kind of enjoyed the movie because we paid for 3 tickets that day, we still suggest not going and watching it. PS. – If you want to get featured in our words, you just have to watch a movie with us like Somya & Onish. Don’t worry, tickets are on us! When we expect the next sequel of boyka? The sequel to the Boyka franchise is not yet planned. Once there is any news on the same, we will update it here on our site. Thanks for visiting us, stay in touch! Thank you so much filmeekeeda for replying.waiting for an update on this soon!